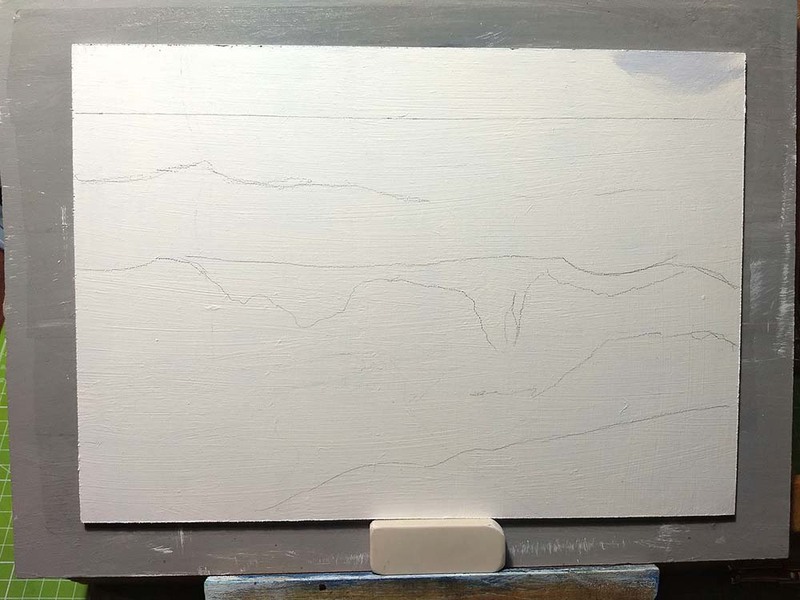 today I want to show you a small photo step by step kinda tutorial of an oil painting. At the time where I have started this painting I was sick of quick drying paints like acrylics. I wanted to paint in a more relaxed way. 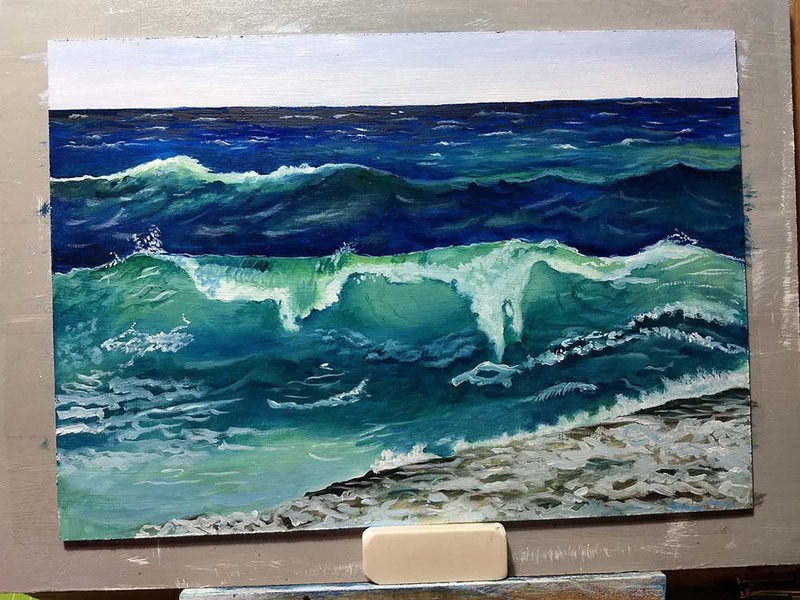 I decided to get my oils out of my drawer and give them an other try. A size A4 MDF board from the hardware store. They have cutted it for free into this size. Acrylic gesso, I used white gesso from Schmincke. But I believe any brand will work. Oil paints Norma from Schmincke, these are higher quality paints. I believe that life is too short to be annoyed with cheap paints. And if you know how to mix colors and tones then you don’t need to buy every tube. School quality brushes from Da Vinci. But lets start with the first photo, the reference photo. I got this photo from Pixabay. Every photo in this blog is clickable. That means if you click on a photo you get a bigger size in a new tab. At first I sketched some rough lines only for my orientation. As you can see I painted at first the sky. I painted in very thin layers. 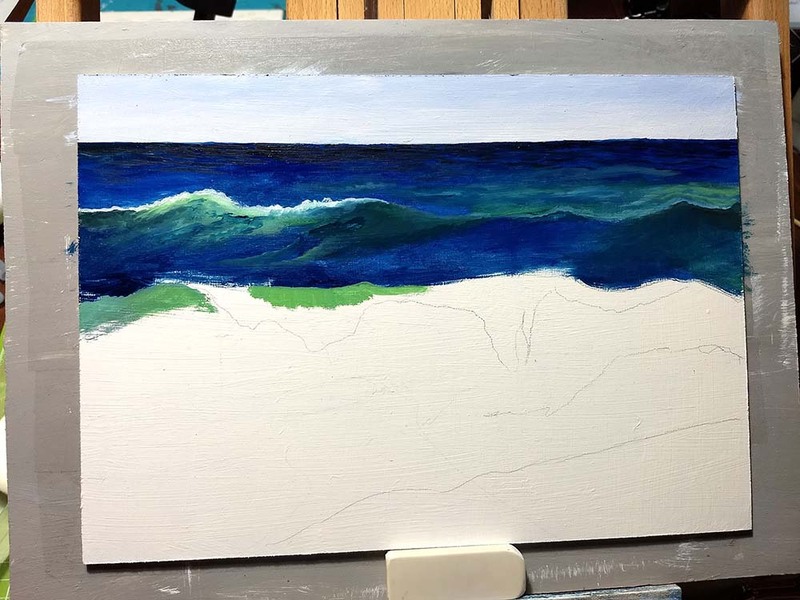 For oil paints, it is important to paint thick layers over thin layers to prevent cracking of the paint. 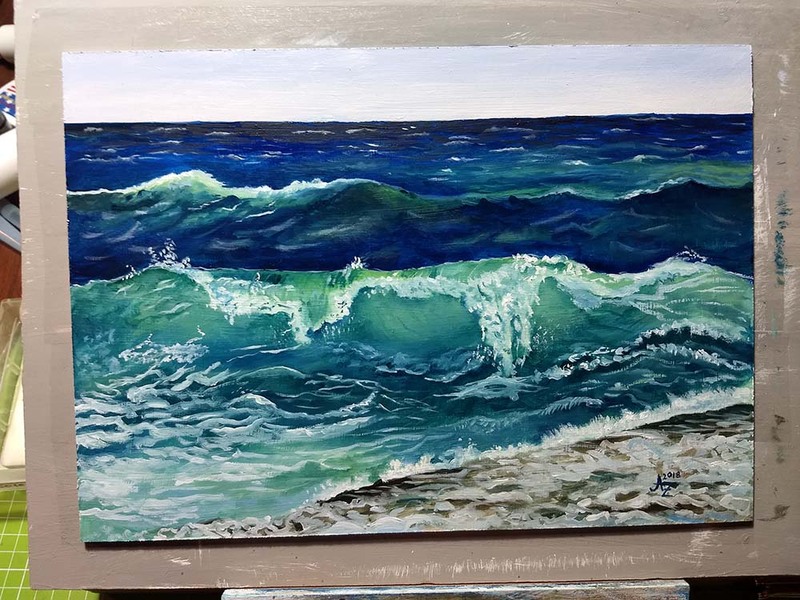 For the sky I mixed titanium white with ultramarine blue and medium L.
The sky is ready and I start to paint the back sea. 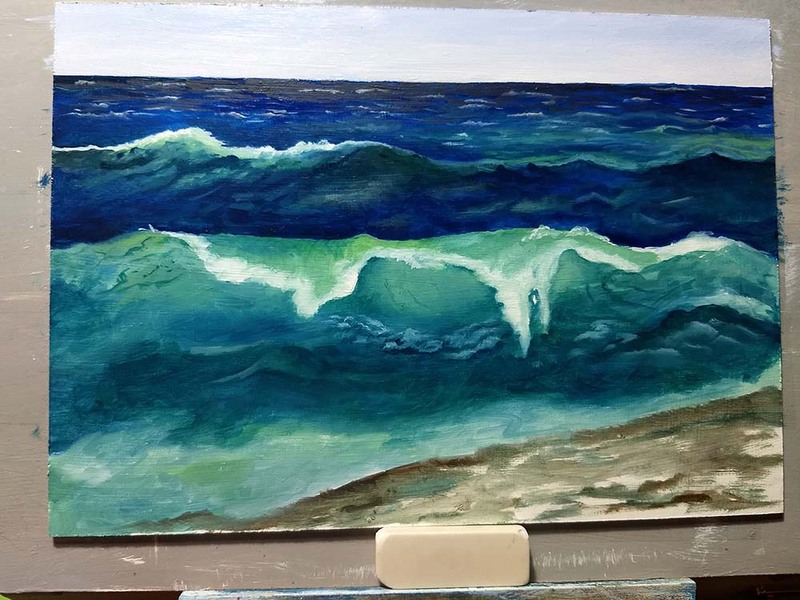 My brushstrokes are wavy from the beginning. This creates a nice texture. 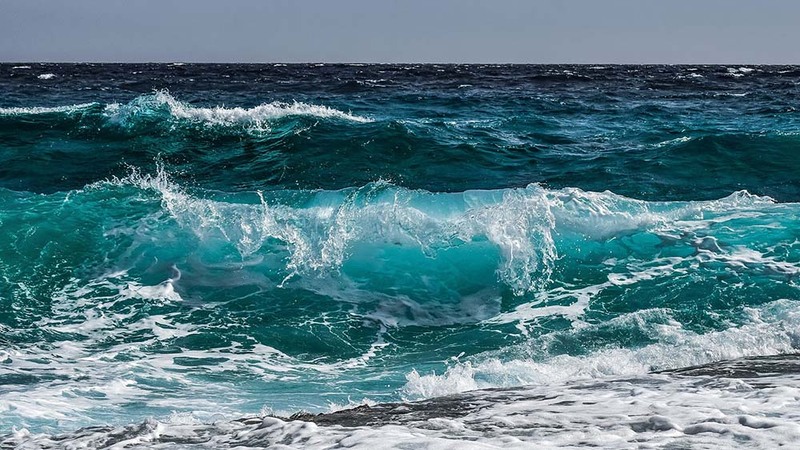 This photo contains 3 layers of ocean. 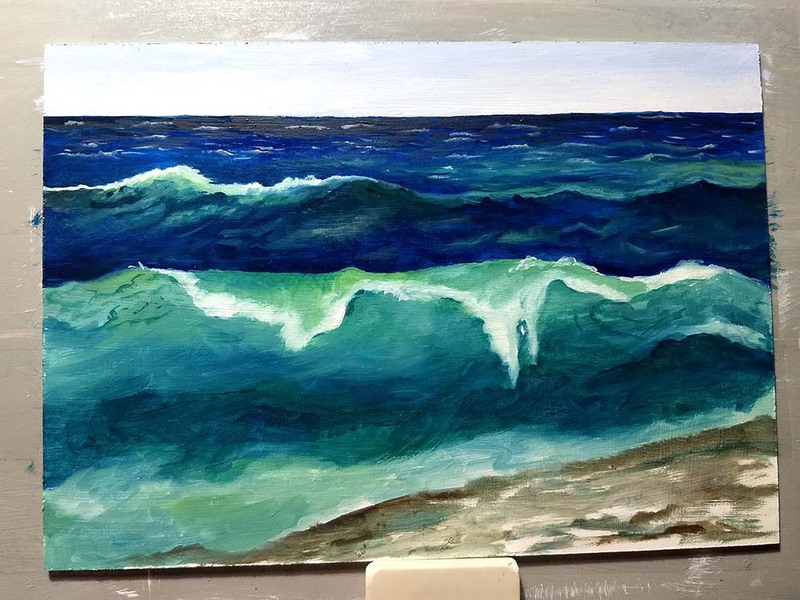 The back sea is alread blocked in with a dark paint and in front of this there comes a middle wave and a front wave. The middle wave is slightly darker at the front. Here I use the same tone as the back sea. 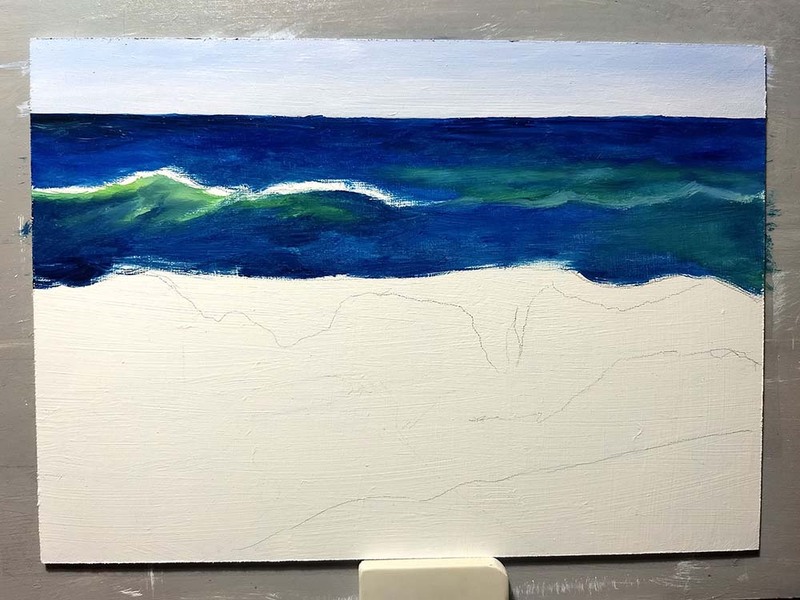 To get the translucent look of a wave I add some yellow for a greener tone. In the sea there are seaweed and if the sun shines through, you can see it. At this stage I decided that it would be better to firstly block in all the main colors and let it dry over night. In all my paints I always mixed in some medium L for smaller drying time. Titanium white has the slowest drying time. I let all the areas free where I will add white at the end. This helpes me also for a better orientation. 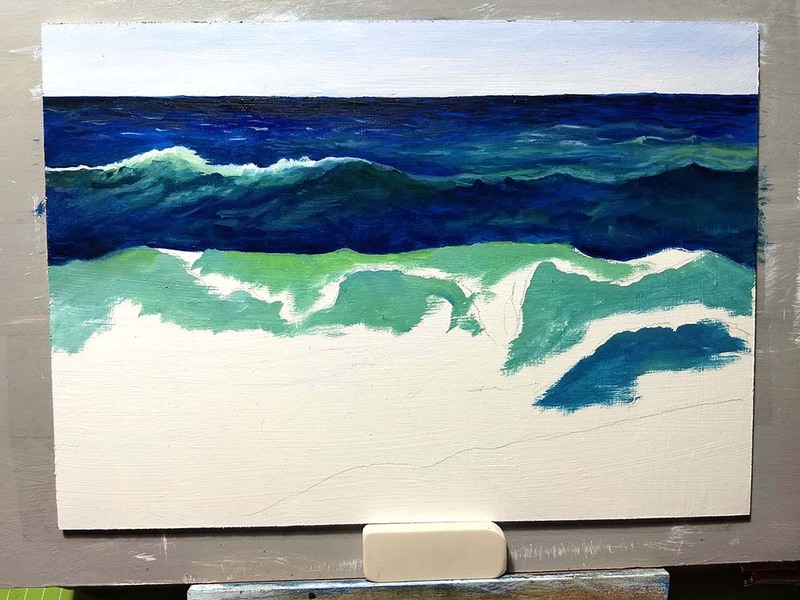 Now all the basic colors from the sea are blocked in. You can still see my brushstrokes. I applied it very thin because I just want to cover the white. 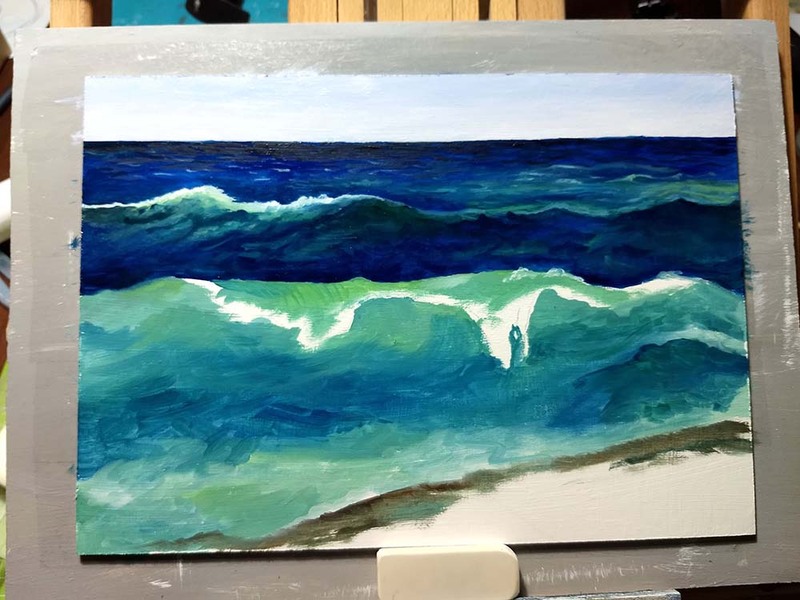 The rocky beach in the foreground has also get his basic colors. Now it is time to wait a night for drying. 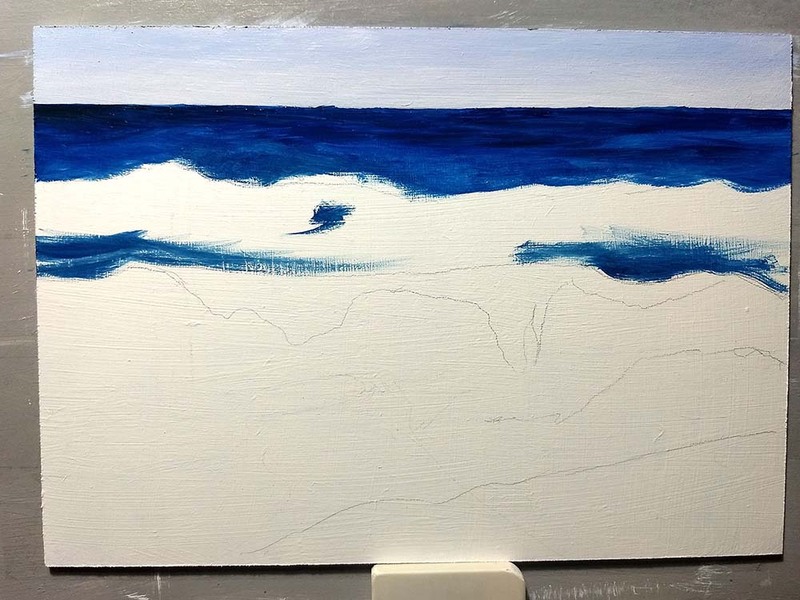 It’s the next day and the first thing I have done is to darken the middle area of the front wave. 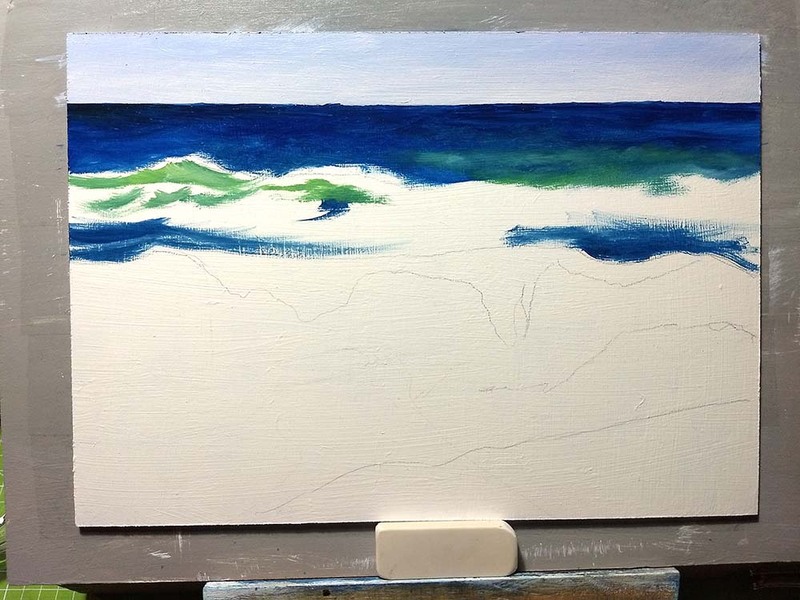 This smoothen out my brushstrokes and creates more depth into the wave. 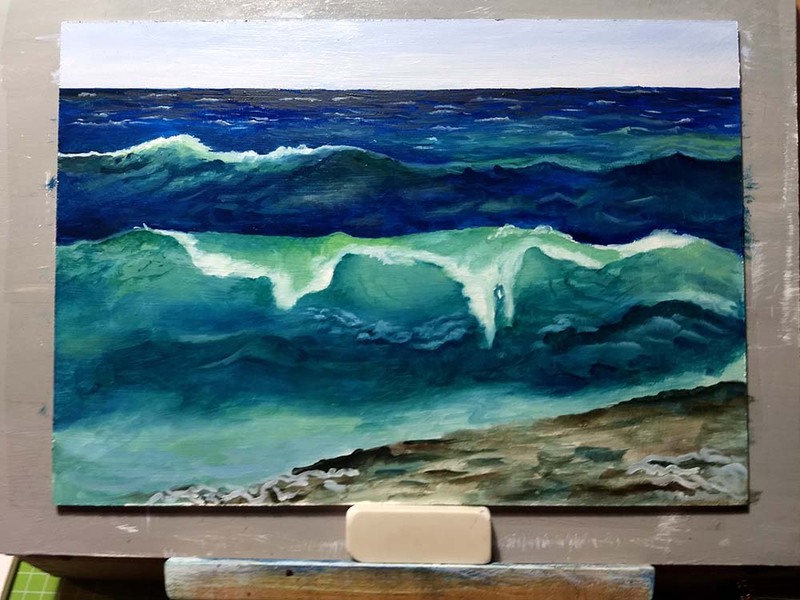 I have now painted some dark foam under the overlapping wave. 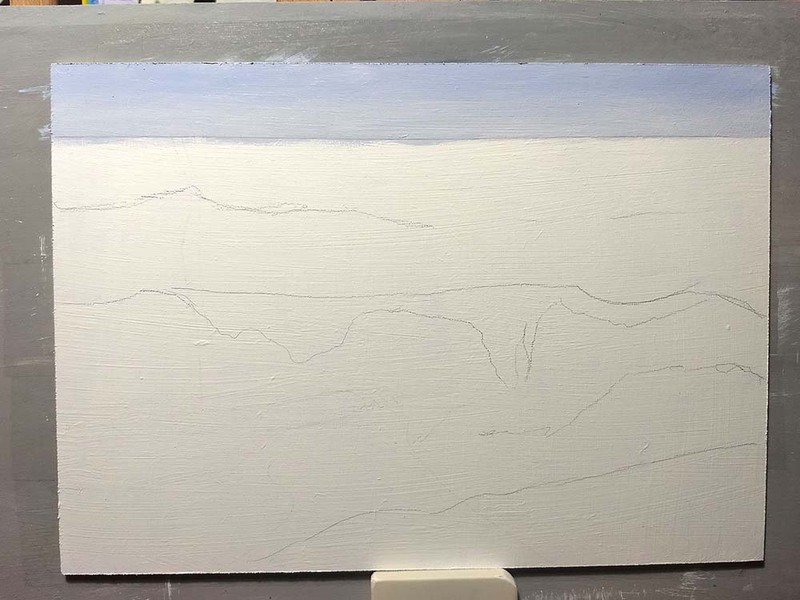 The next step was to darken the rocky beach and hiding every bit of white with a greyish brown tone. 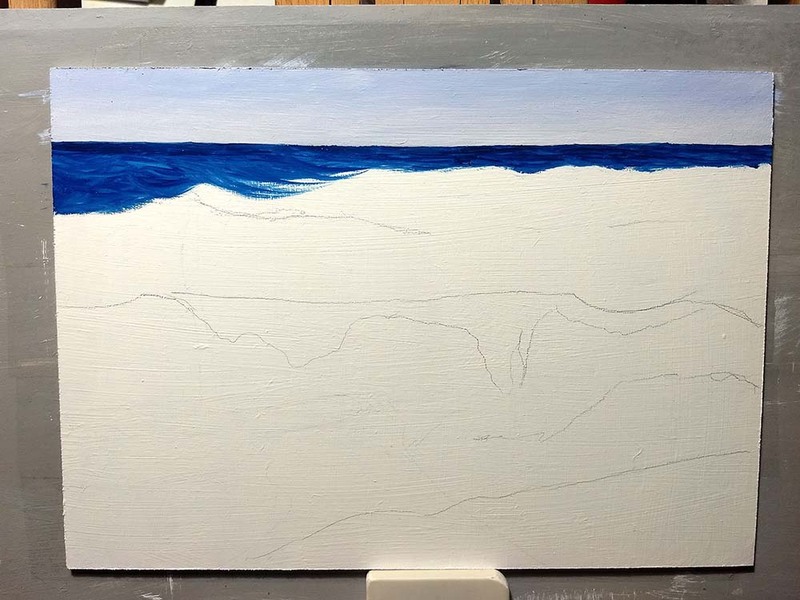 Because the beach is not my planned focal point I start to add the foam with a muddy white. The rocky beach is now covered with spray and foam and I am ready to do the magic on the waves. 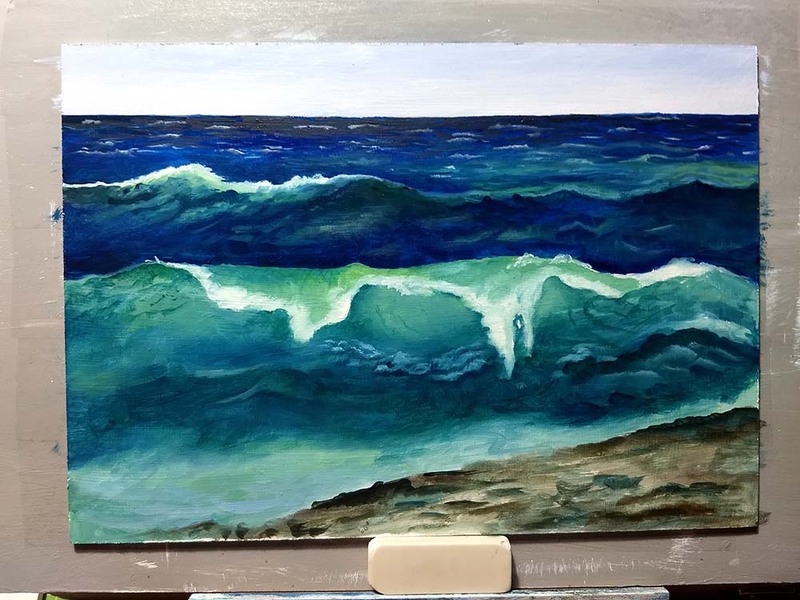 I added some light spots on the middle wave and start to paint the foam on the front wave and the spray on top. 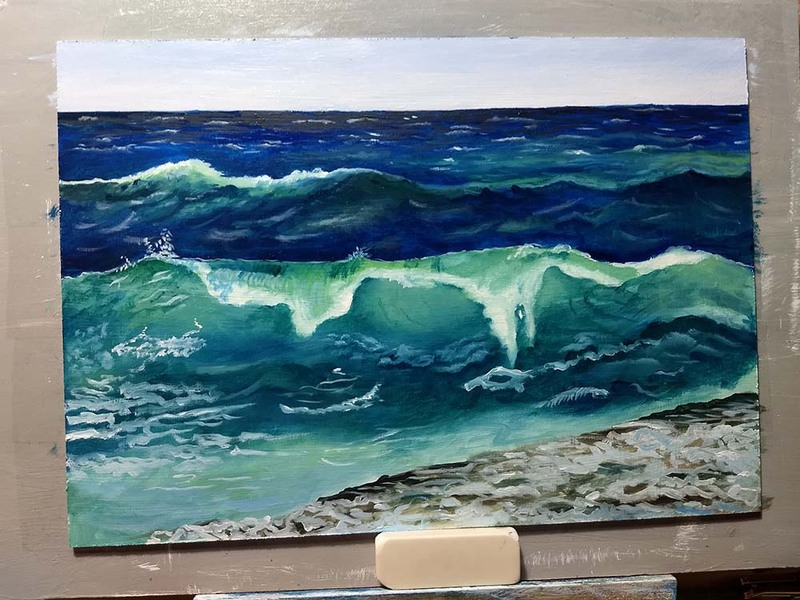 In the next step, I painted the high-splashing water behind the rock. To get a rich value I have to darken the water behind it. And this is the finished painting. I added more foam and spray. 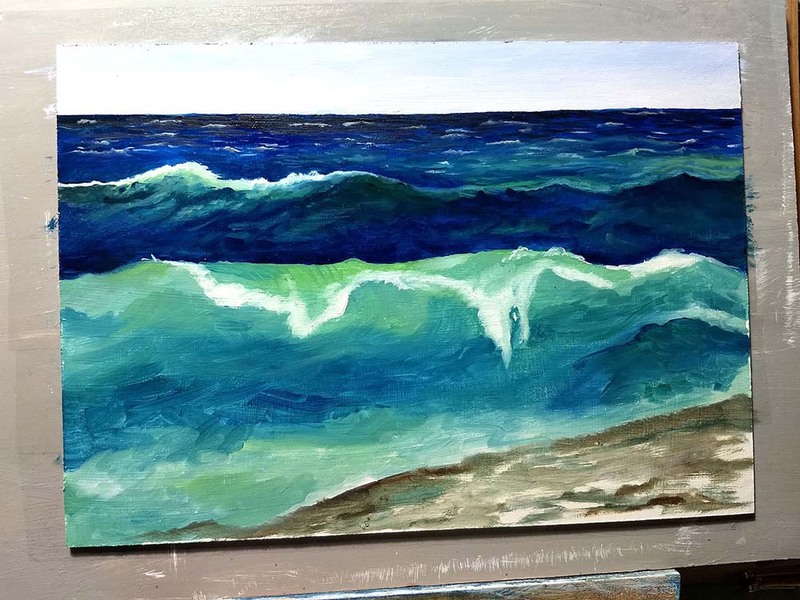 I added highlights and shadows in the foam of overlapping wave. This creates a really natural look. All the white I added at the end is pure without any medium. I believe it has to dry 1-2 weeks. I hope you enjoyed this little photo step by step thing. See you next time.